An Apple invention published Thursday fleshes out the folding iPhone concept revealed in a separate patent grant last week, adding features like a wraparound display and touch sensitive structures to all external surfaces. As published by the U.S. Patent and Trademark Office, Apple's patent application for "Electronic Devices With Display and Touch Sensor Structures" describes a touch capable portable device made substantially of glass, sapphire or other suitable transparent material. Of note, the proposed device features curved glass sidewalls under which are disposed touch sensitive displays, a design that echoes a wraparound display patent assigned to Apple earlier this year. More specifically, a main display structure situated on the phone's front face extends beyond traditional border regions and onto the curved sides. Optionally, Apple considers options for other sidewall shapes like a half-oval or steep angular slopes. The designs are akin to those implemented by smartphone rival Samsung in the Galaxy Edge series. Potential sidewall designs (left) and folding mechanisms. In some embodiments, the device incorporates touch layers on all surfaces, including the rear wall. Very few OEMs have built rear-facing multitouch controls into their portable hardware for fear of confusing users. Microsoft experimented with similar solutions behind the scenes, but the technology never made it into a shipping product. Further, one of the more successful consumer options, Sony's PS Vita, was notoriously underutilized by third party developers. 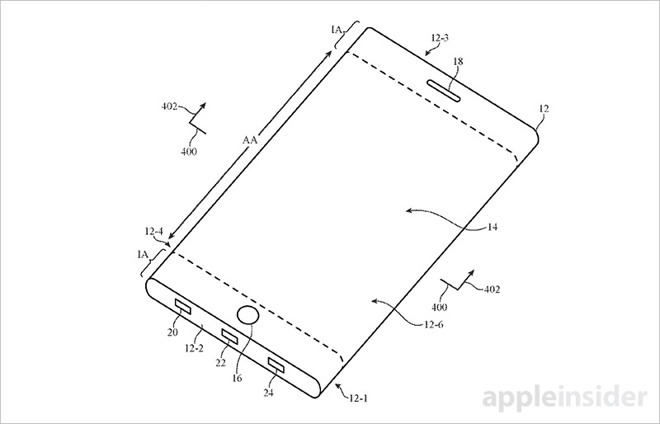 Beyond an all-touch surface, Apple's document goes on to say that a curved wall iPhone might also feature an enclosure allowing the device to bend or fold along one or more axes. Most of the discussion revolves around a completely transparent single-bend design which folds over onto itself, much like a clamshell iPhone detailed in a patent grant uncovered by AppleInsider last week, but other techniques like double folds are also mentioned. The application goes on to summarize multi-bend implementations and the necessary underpinnings that would facilitate such designs, including hinge-type, accordion-style and other flexible structures. Whether Apple intends to release a curved screen iPhone, let alone one that folds in half, is unclear. The company's next-generation handset is expected to feature an edge-to-edge OLED display, glass sandwich design and wireless charging, but none of the exotic technologies outlined in today's patent. 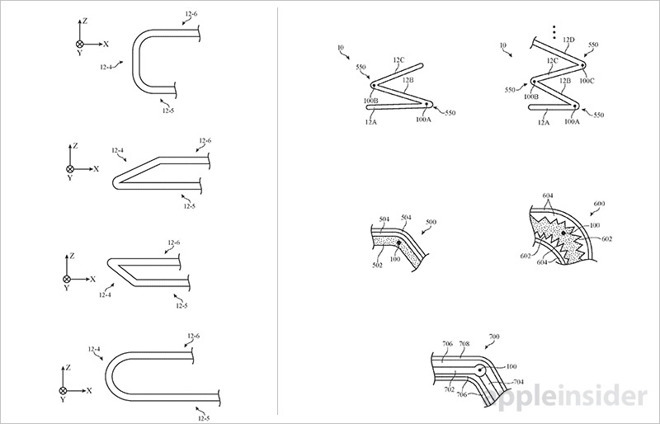 Apple's curved wall, foldable iPhone patent application was first filed for in May 2016 and credits Isaac W. Chan, Chun-Hao Tung, Fletcher R. Rothkopf, Sunggu Kang and John Z. Zhong as its inventors.